Our custom-designed, continuous concrete landscape edging is available in the widest variety of styles and colors in the Wichita area. Ultimate Edge, LLC was developed for the benefit of the customer who wishes to have quality concrete landscape curbing installed with courteous and professional service. Our custom-designed, continuous concrete landscape edging, or curbing, is available in the widest variety of styles and colors in the Wichita area. At Ultimate Edge, LLC our focus is on quality. The equipment and processes we use are designed to create the strongest, longest-lasting continuous concrete curbing made today. Our concrete landscape edging is formed and installed using a concrete extruding machine that creates flowing curves around existing or new landscape areas. Installation is fast, clean and less expensive than other methods of installing landscape edging, such as bricks or stones. Adding color and texture to your concrete curbing is an easy way to accent your home, buildings or any other landscape décor. Select from a multitude of colors, patterns and designs which will compliment the color scheme of your landscape. 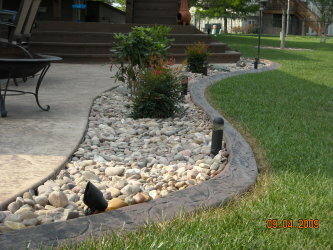 Concrete landscape curbing is great for edging around trees, bedding areas, ponds, rock gardens and rock or mulch paths. We also offer a 24” wide concrete garden path – it is produced and installed using the same quality-proven method as our concrete curbing. Curb Lights installed in the edging give your landscape a warm glow in the evening and at night while providing extra security and safety. We also install landscape edging or commercial-grade curbing for businesses. Concrete curbing is virtually maintenance-free and also functions as a permanent weed barrier that will enhance your landscape for many years to come. Our custom concrete landscape edging is designed and produced on-site to your specifications. If you are unsure of your needs or have design questions, we will work with you to create the best custom design for your landscape. At Ultimate Edge, LLC, customer satisfaction is our top priority. Our quality products offer a wide variety of colors and styles to enhance your landscape. We are confident we can exceed your expectations for your home or business landscape curbing needs. Contact us for a FREE on-site estimate today!